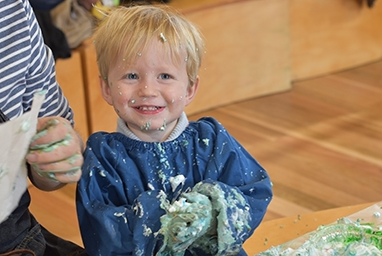 Hear about the adventures of Squidge and then jump into the world of all things messy. Put on your aprons and roll up your sleeves for a squishy, squelchy, splashy, sploshy time. Through story, creative play and sensory games, children will be led through an exciting textural landscape where grubby fingers are the name of the game! This workshop involves food items. Please contact ArtPlay before you book if your child has a food allergy. Please wear clothes you don’t mind getting dirty. Each child must be accompanied by an adult. If you are bringing more than one child, it is recommended that extra adults attend.